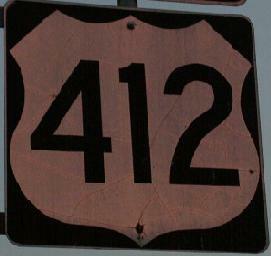 U.S. Federal Route 412 is one of the longest east-west highways across the State of Oklahoma. From near Westport, to near Perry, this runs along the Cimarron Turnpike. Plus, from near Locust Grove to near Flint, it runs along the Cherokee Turnpike. Info on U.S. Rt. 412 is broken down by county below.